Orion is the exploration spacecraft designed to carry astronauts to destinations not yet explored by humans, including an asteroid and NASA's Journey to Mars. On Wednesday, Nov 2nd , 2016 at 7 pm, Dr. Lynn Cominsky of Sonoma State University will give a free, illustrated, non-technical talk. The deadline for submission is December 10th, 2016. A beta version of the new portal for Lunar Mapping and Modeling called "Moon Trek" has been released. Ewen Whitaker, the last of the pre-Apollo selenographers, died Oct 11th 2016. NASA is planning payloads for Exploration Mission 2 with a planned launch on a circumlunar mission in 2021. SSERVI Deputy PI Tony Colaprete has been selected as the 2016 recipient of the award. An ISS astronaut photographed the green aurora and details of the northeastern Canadian landscape from space. Announcing an opportunity for the submission of multi-institutional team-based proposals for researchers participating as members of SSERVI. SSERVI participated in the ISS Space Festival in Novato, CA. Jenna Crowell is a member of the SSERVI CLASS team at the University of Central Florida in Orlando FL. While Curiosity explores Mars, gamers can join the fun via a new social media game, Mars Rover. Volunteers are needed to advise high school students in the Exploration of the Moon and Asteroids by Secondary Students (ExMASS) program. The 2016 Exploration Science Forum was streamed live! A group of Upper Darby High School students will compete at the 2016 Exploration Science Forum. A conference on the science, robotic reconnaissance, and human exploration of the two moons of Mars. New crew arrives safely to ISS, and Juno arrives at Jupiter this week. Juno reaches a milestone on our journey of discovery. NASA's Juno mission prepares for orbit insertion. Call for abstracts for special AGU Session P016: Little bodies at big facilities – synchrotron and neutron scattering of icy planetary materials. Join us on the Journey to Mars as we explore with robots and send humans there one day. Two fully-funded PhD opportunities available for candidates from a range of backgrounds in the physical sciences (geology and geophysics, physics, astronomy or planetary science). NASA uses the vantage point of space to increase our understanding of our home planet, improve lives and safeguard our future. The European Space Agency (ESA) has produced a very interesting public outreach tool for lunar exploration. A key step towards finding “Earth 2.0” will be to identify rocky planets that occupy the “Habitable Zone” of their stars. NASA has increasingly relied on solar electric propulsion for long-duration, deep-space, robotic science and exploration missions. NASA is requesting industry proposals for concept studies and technology development projects for habitation, advanced propulsion and small satellites. During a December 2013 solar flare, three solar observatories captured the most comprehensive observations of a current sheet. SETI is looking for uniquely talented Planetary Scientists to bring disruptive new thinking to NASA's Asteroid Grand Challenge. ExMASS is an academic year-long, national standards-based lunar/asteroid research program that envelops students in the process of science. The 2016 Human Exploration Rover Challenge held April 8-9 at the U.S. Space & Rocket Center in Huntsville, Alabama. On April 6, 2016 at 7 pm, Dr. Tom Abel of Stanford University will give a free, illustrated, non-technical talk in Los Altos, CA. The 2016 Summer Exchange Program is dedicated to the exchange of US and Italian students in science and engineering. Kelly joined the astronaut corps in 1996 and currently holds the American record for most time spent in space. The period of total eclipse, called totality, occurred from 8:38 to 8:42 p.m. The conference will be held July 18-19th 2016 at NASA Ames Research Center at Moffet Field, CA. ESA's Moon base hopes to follow the International Space Station as a global project. This year's application deadline for grants from the Barringer Family Fund for Meteorite Impact Research is April 8, 2016. 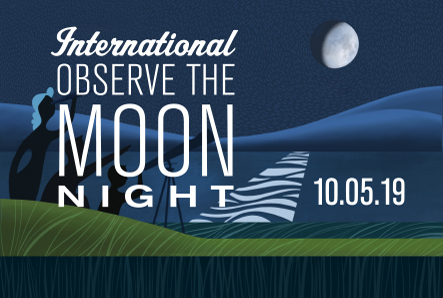 On February 22, 2016, the United States Postal Service will release a new, one-ounce, international-rate stamp: The Moon Forever. An astrophysics mission-- the Wide Field Infrared Survey Telescope (WFIRST)-- will help unlock the secrets of the universe. The National Science Foundation's Laser Interferometer Gravitational-Wave Observatory has detected gravitational waves for the first time. Micro 57 is March 19-20, 2016 at theThe Woodlands, Texas, just prior to the 47th Lunar and Planetary Science conference. Astronaut Edgar Mitchell, lunar module pilot on Apollo 14, passed away on the eve of the 45th anniversary of his lunar landing. NASA’s latest video depicts the dwarf planet Ceres, as seen by the Dawn spacecraft. NASA paid tribute to the crews of Apollo 1 and space shuttles Challenger and Columbia during the agency's Day of Remembrance. Draft CAN released for community review and comment, solicits proposals for researchers who want to become participating members of SSERVI. Students from around the world have designed lunar mission concepts for the next step in lunar exploration. NASA's Dawn Mission scientists say the mysterious bright spots that glow from Ceres' dark surface like headlights are the result of mineral salts. Webb will study the cosmos’ first luminous glows, the formation of solar systems capable of supporting life on planets like Earth, and the evolution of our own solar system. Stunning New Animation Reveals Pluto as Never Seen Before! Arlin was an "outside the box" thinker that made many rethink paradigms assumed to be truth. SSERVI's RIS4E team has developed Graduates for Education and Outreach (GEO)-- a new initiative to engage younger learners. NASA plans to evaluate, and potentially exploit, ices and other volatile elements in the polar regions of the Moon. From possible ice volcanoes to twirling moons, NASA’s New Horizons science team has made more than 50 exciting discoveries about Pluto. An animation from NASA's Mars Atmosphere and Volatile Evolution (MAVEN) mission shows how the solar wind strips ions from the Mars' upper atmosphere into space. The 2016 Exploration Science Summer Internship program application deadline is January 15, 2016. On Wednesday, Nov. 11th, 2015, at 7 pm, Dr. Robert Kirshner (Harvard University) will give a free, illustrated, non-technical talk in Los Altos, CA. NASA's Cassini spacecraft will sample an extraterrestrial ocean on Wednesday, Oct. 28, when it flies directly through a plume of icy spray coming from Saturn's moon Enceladus. Robert Farquhar was a 50-year veteran of deep space missions and was often referred to as a genius in his field. The Saturn moon has become one of the most promising places in the solar system to search for present-day habitable environments. Submit designs for structures on Mars that use existing Martian material and you could win $10,000! New findings provide the strongest evidence yet that liquid water flows intermittently on present-day Mars. The moon will appear to blush orange-red late Sunday night/early Monday morning as it undergoes a total eclipse, visible across America. The latest images from NASA's New Horizons spacecraft were stitched together and rendered on a sphere to make this flyover. The LADEE NMS instrument confirms that the moon’s exosphere is made up of mostly helium, argon, and neon. This year’s Perseid meteor shower peaks on August 12th and 13th. The Moon will be nearly new, setting the stage for a great display. This series of images shows the fully illuminated “dark side” of the moon that is never visible from Earth. Students presented posters at the Exploration Science Forum, July 21-23, 2015, at Ames Research Center, Moffett Field, CA. 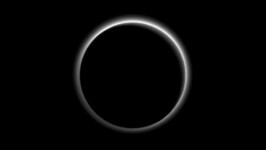 Flowing ice and a surprising extended haze are among the newest discoveries from NASA’s New Horizons mission. Australia becomes an Affiliate member of SSERVI to help NASA achieve its goals for human exploration of the solar system. NASA snaps new picture of Earth from a distance of one million miles. After a decade-long journey through our solar system, NASA’s New Horizons spacecraft is at Pluto. A Field Guide to the Solar System: a look at the moons, planets, asteroids and comets photographed by NASA. A high-contrast array of bright and dark features covers Pluto’s surface, while Charon has a more uniform light gray terrain. The workshop at NASA Ames on July 7-9 will advance our understanding of Potentially Hazardous Asteroids. Author Andy Weir visited NASA Ames and stopped in at SSERVI to talk about his book "The Martian." Impact glass detected by NASA's Mars Reconnaissance Orbiter may provide a window into the possibility of past life on the Red Planet. The National Academy of Sciences has published a short biography of Gene Shoemaker. Hubble has provided a new view of Pluto and its moons revealing a cosmic dance with a chaotic rhythm. Since its launch in March 2009, Kepler has revolutionized humankind’s view of our place in the Universe. NASA has selected nine science instruments to investigate whether the mysterious icy moon could harbor conditions suitable for life. Scientists and engineers are designing a mission to Schrödinger that collects lunar samples and returns them to Earth. "MoonLIGHT" Lunar Laser Ranging Array Will Bring New Insights into General Relativity. SSERVI's FINESSE team Co-Investigator Dava Newman steps into new role as NASA's Deputy Administrator. NASA seeking a dexterous spacecraft that can also use robotic systems to grapple and refuel a government satellite in low-Earth orbit. Seventy days worth of solar system observations from NASA's Kepler spacecraft are highlighted in this sped-up movie. New Horizons is now within sight of all the known members of the Pluto system. Dark geological features are likely sea salt from a subsurface ocean, discolored by exposure to radiation. The mysterious bright spots on the dwarf planet Ceres are better resolved in a new sequence of images taken by NASA's Dawn spacecraft. Registration now open for the 6th Annual Lunar and Small Bodies Graduate Conference (LunGradCon 2015)! NASA is seeking public input on establishing sustained human presence on the red planet. 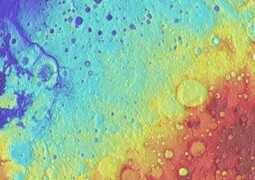 NASA celebrates successful MESSENGER mission as it impacts the surface of Mercury. Congratulations to SSERVI's SwRI researcher Bill Ward for this important achievement! NASA releases Hubble image of the star cluster Westerlund 2-- a giant cluster of about 3000 stars. See the complete list of winners, full replays, and photos from the race held on April 17-18th in Huntsville, AL. Congratulations to the seven students chosen to participate in this year’s program! The annual NASA Human Exploration Rover Challenge will take place April 17-18th. Apparently the Moon has two tails, LADEE finds nano-sized dust particles streaming in its wake. SSERVI Director Yvonne Pendleton was recently a guest on StarTalk Radio with host Bill Nye. As NASA missions explore our solar system and search for new worlds, they are finding water in surprising places. The total lunar eclipse on 6:16 a.m. EDT Saturday, April 4, lasted for only five minutes! Opportunity for US students to work at the SCF_Lab on Laser Ranging. The application deadline is May 3. The MoonRIDERS team has been invited to participate in a project to fly a dust shield experiment to the Moon. NASA releases Vesta Trek, a free, web-based application that provides detailed visualizations of Vesta. NASA announced more details in its plan for its Asteroid Redirect Mission (ARM). High school and college teams from around the world will race against each other during NASA’s Human Exploration Rover Challenge April 17-18th. Submissions are requested by June 30th, 2015. Fireballs in the Sky is a citizen science initiative that allows everyone to share the discoveries of the Desert Fireball Network. New Desktop Application Has Potential to Increase Asteroid Detection, Now Available to Public. Field Training at McCartys lava flow. Hubble provides best evidence yet for underground saltwater ocean on Jupiter’s largest moon Ganymede. Cassini provided the first clear evidence that Saturn’s moon Enceladus exhibits present-day hydrothermal activity. NASA Spacecraft Nears Historic Dwarf Planet Arrival. PhD student opportunity at ETH-Zürich, Switzerland in anticipation of the upcoming Mars Insight mission. Learn how to find and use higher-level data products from the Lunar Reconnaissance Orbiter (LRO). Former NASA Astronaut, Dr. Ed Lu, CEO of the Sentinel Mission, will give a free, illustrated, non-technical talk on 3-4-15. An opportunity for graduate students and postdocs interested in analogue sites for lunar impact craters, or impact cratering in general. NASA is recognizing 50 years of spacewalking, or Extravehicular Activity (EVA), in 2015. The time-lapse frames in these images were magnified to make it easier to see the orbit of Pluto and Charon.